Size: 4.8" x 3.1" x 0.65"
Just a design variation of the TI-503SV introduced for the Back-to-School 2004 campaign and sold together with a red edition of the TI-503SV through the Wal-Mart retail chain. 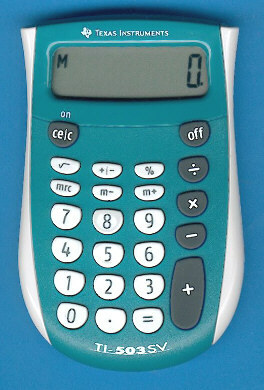 Retail competitor Target continued this idea in 2007 with a pink TI-503SV. © Joerg Woerner, September 15, 2004. No reprints without written permission.